Benkei (ベンケイ?) is Yoshitsune's beautiful and skilled second-in-command. 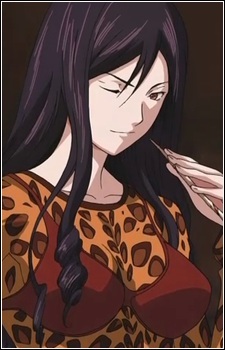 She is often portrayed as a panther because her fighting style and aggressive behavior both in and out of battle and is completely loyal to Yoshitsune and Trident. She becomes Kogarasumaru's trainer and extra member during Ikki's hospitalization period. During a match against another team, she fights Sleeping Forest's Water Queen, Om, and eventually overcomes her, with some help from Kazu. Recently, she is seen delivering Yoshitsune's bloodied "Ram Jet" Regalia to Kogarasumaru's headquarters with her right leg cut off. After completing this mission, she breaks down and cries. It is revealed she was the only survivor of the battle of Osaka in which Genesis exterminated Trident. Benkei actually cut her own leg off with a blade hidden within her Panther Corsa weapon to escape from the mecha that held her captive. She doesn't die from blood-loss since she's a proclaimed vegetarian.